Malcolm Gladwell writes, in a new article, Late Bloomers: "Doing something truly creative, we’re inclined to think, requires the freshness and exuberance and energy of youth". In particular, we think you have to be in your twenties. This stereotype is unjustified. 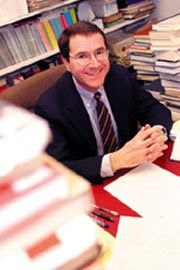 Gladwell quotes work by University of Chicago economist David Galenson (photo), author of Old Masters and Young Geniuses, who listed top 11 poetry contributions published since 1980 and found they were composed at the ages of 23, 41, 48, 40, 29, 30, 30, 28, 38, 42, and 59, respectively. Galenson concluded that there is no evidence for the notion that lyric poetry is a young person’s game.